A flood of a certain size can happen in any year based on a 1% probability based on historic records and calculations and modelling done by Engineers. It can happen next year, or in 10 years it just has a 1 in 100 year chance of happening in any given year. The historic records and calculations are very reliable, however the modelling element and how water flows across land, especially large catchments such as the Eden, Derwent and Kent in Cumbria are complex. The Environment Agency, having spent significant money on flood defenses in Carlisle, and Cockermouth, have attempted to model and control catchments that can sometimes be even more complex. An example being the removal of water from water from Thirlmere by Unitied Utilities during the 2009 floods in Cockermouth. A local myth in Cockermouth says that UU stopped all water being extracted to the various Manchester supplies and actually increased flows into the local water courses, thus increasing the flows downstream into the Derwent at Keswick and subsequently Cockermouth. So the Environment Agency have a complex catchment to assess and manage, but modern computer modelling does allow to be done and all scenarios assessed. 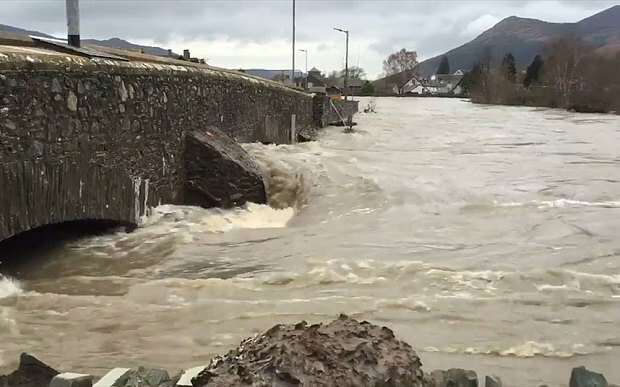 In the following sections, we will explore the main issues which affect flooding happening in Cumbria. 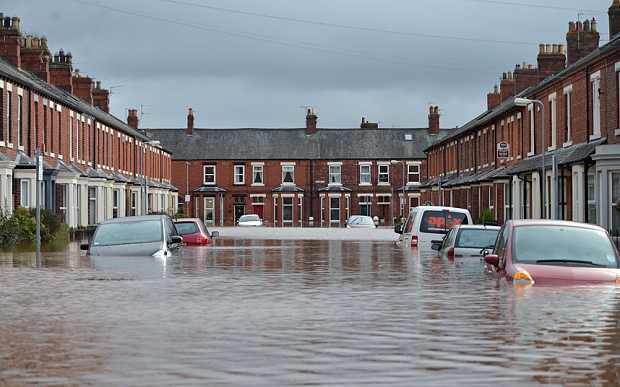 Weather is the primary factor in flooding in Cumbria and combined with the topography, (mountains, steep slopes, lack of vegetation etc) it has a high contributing factor to flooding. The following map shows the distribution of rainfall over the NW England based on historic records. This is called the Standard Average Annual Rainfall and is from records ranging from 1961 to 1990. 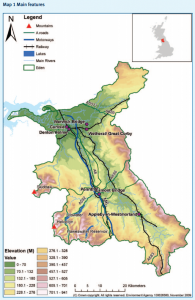 Although the map above, does not show catchments, it does indicate the concentrations of rainfall within the Lake District and the extent of the Eden Valley Catchment. It is going to be interesting to look at the distribution of recent years rainfall especially the period from 2000 to date and the difference to historic data. 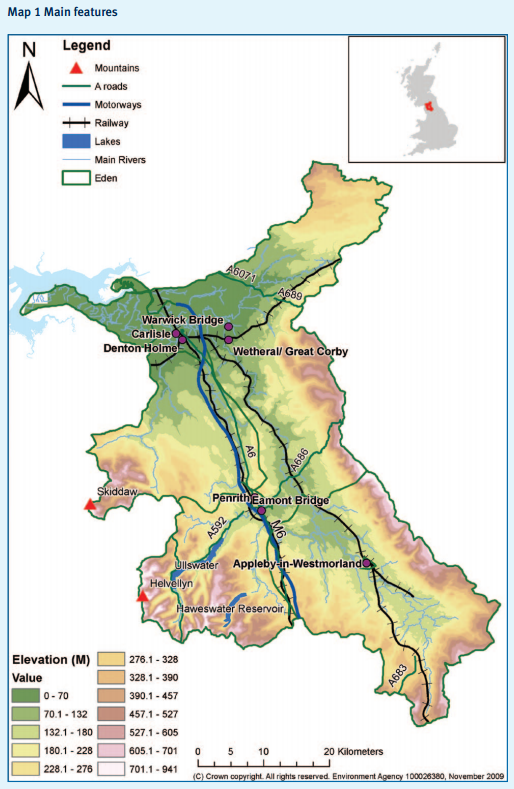 The following map shows the Eden catchment from source to the Solway. The coloring on the map, indicates heights of the land and given the size of the catchment, it shows how complex and large the catchment of the Eden is. In the Eden Valley Catchment Management Plan 2009, produced by the Environment Agency, it considers the catchment management to be applied to various areas of the Eden, and although this is a summary document, it does set out the ways that the Environment Agency is dealing with the management of water in the Eden Valley. Flood alerts produced by the Environment Agency and SEPA are part of the sophisticated model that the environment has for each catchment. 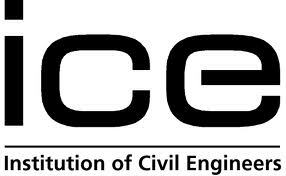 They are based on realtime data gathered in rivers and produced from the model automatically. 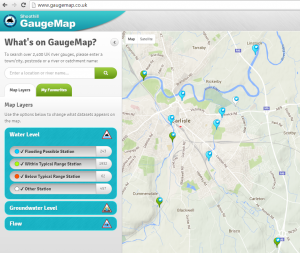 The realtime data is available online at Gaugemap which is run for SEPA and Environment Agency by an external party. Data is measured at the 2000 or so monitoring stations in the UK river network and presented on this website. Also each monitoring point as a social media page and data from them published to that as well. Recently during the December 2015 floods in Cumbria, we used the monitoring points to track the peak flows in the River Eden Catchment. A couple of screenshots from Gaugemap are presented below. Click on the above pictures for larger screenshots. 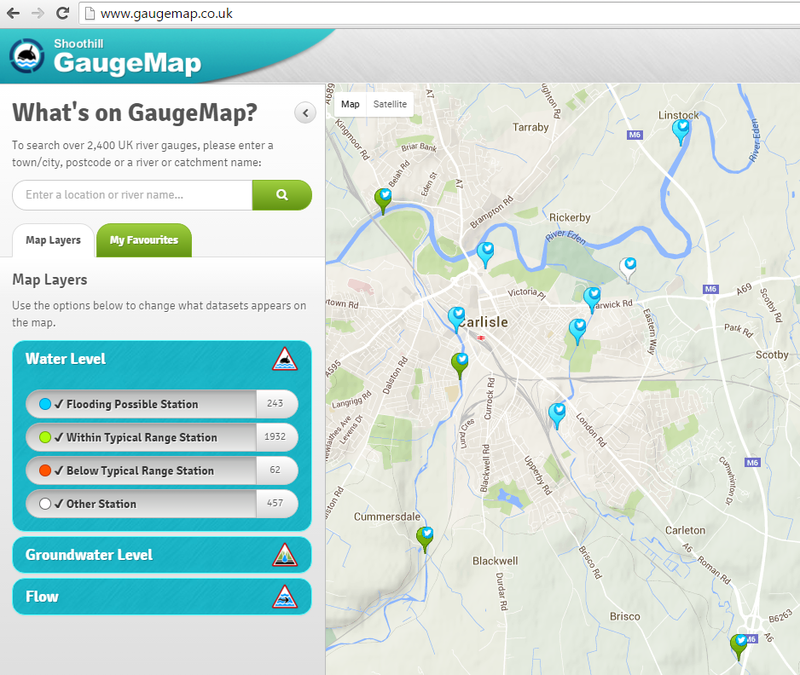 So based on the realtime data, the Environment Agency and SEPA and notify home owners of flood alerts. This can be via telephone (once registered) or thro social media. An example of the social media is presented below. Clicking on the picture will take you too the social media page. The mapping and the notification are based on the complex terrain model which can accurately predict when and where flooding will occur with the anticipated rainfall and measured river flows. 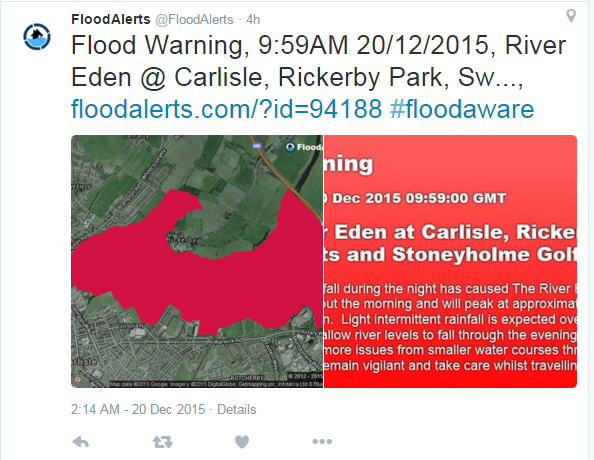 Flood alerts is available on facebook and twitter.